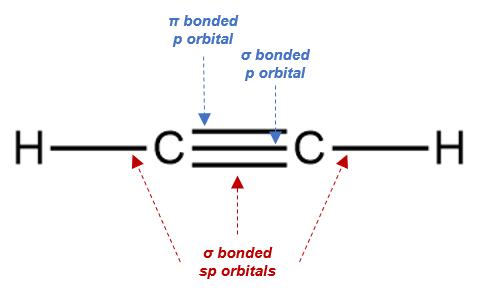 An sp hybridized orbital is an atomic orbital achieved by the interference of one s orbital with one p orbitals. This gives rise to two degenerate hybridized atomic orbitals. As compared to sp3 and sp2 hybridization, sp hybridization helps us understand the structure of triple-bonded hydrocarbons like ethyne, propyne, etc. In this case, the carbon atom is bonded to only 2 other atoms. Therefore, one s orbital interacts with one p orbitals, to form 2 degenerate sp hybridized orbitals.